I have a friend who’s expecting a little sweet pea, a sweet pea prince if you will, in less than a month. Her name is Maria and she and her husband, Josh, have the most beautiful blog called Two Peas & Their Pod. They whip up the most fabulous food! I met Maria through twitter and had the pleasure of meeting her in real life last fall at Blogher Food. Let me tell you, she is the sweetest little sweet pea you’d ever want to know. a little sweet pea of her own. 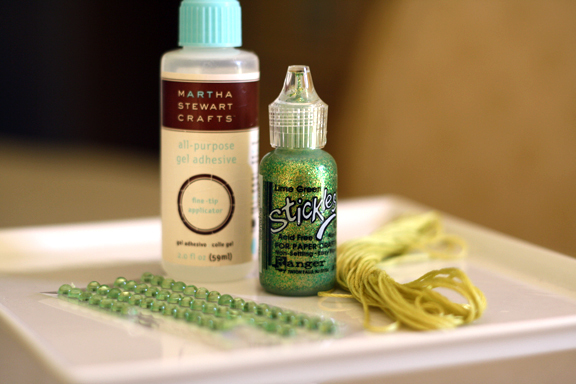 A group of bloggers have gotten together to celebrate Maria and her soon-to-come sweet pea with a virtual baby shower! 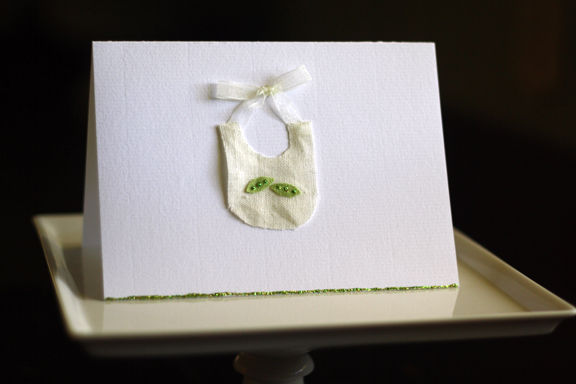 I knew right away that I wanted to design some baby cards for the special occasion. 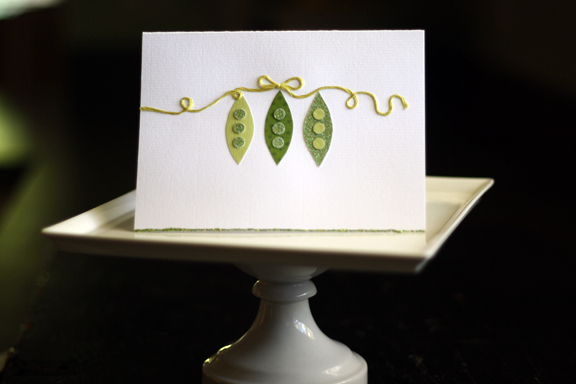 But not just any baby cards…sweet pea baby cards. 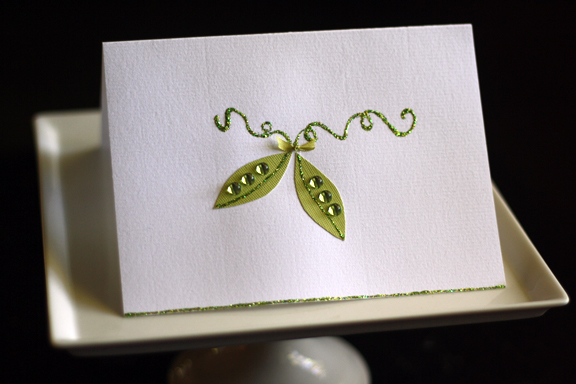 I had such fun coming up with all of the sweet pea designs. 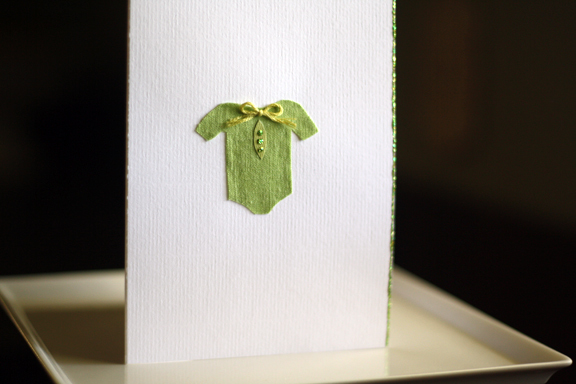 and tiny itty bitty sweet pea onesie. 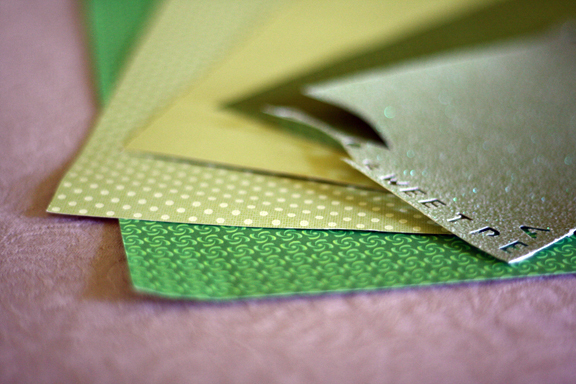 and colored and patterned papers and linen fabric (no pictured). 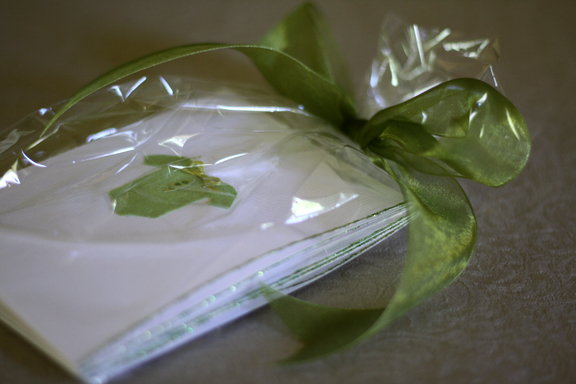 and you’ve got yourself a perfect little sweet pea card package that can be used as thank you notes by mama or put into a frame to decorate the nursery! Can’t WAIT to meet your precious little sweet pea prince, Maria! I’ll be sending you your bundle of cards to enjoy just as soon as possible! I couldnt adore these more Wendy… you are SO talented. I wish I had words to describe it!! I am just blown away by how beautiful these are!!! These are absolutely gorgeous, Wendy. You are so talented! I know Maria and Josh are going to treasure them. Oh my GOSH!!! How *cute* are these?!?!? Love them ALL…and especially that little bib! You are multi-talented, Wendy! Oh how sweet are these!! Love them all Wendy! you are incredibly talent Miss Wendy-girl . . . LOVE THESE!!! Adorable! That are absolutely the cutest Wendy! Oh my goodness! Those cards are the cutest thing ever! Thanks so much for thinking of us! We are so excited for our little pea to come. Your friendship means the world. Love to you! I don’t have a crafty bone in my body so I take my hat off to you! These are adorable!!! Oh those are just too cute for words! I absolutely love them! These are the cutest cards, Wendy! 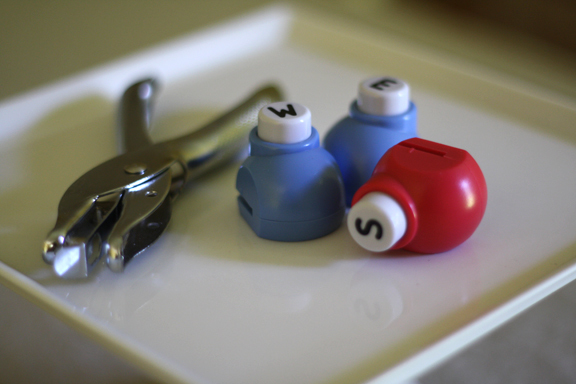 You should open an Etsy store and sell these… seriously. Wendy, I’m in full agreement with Kristen! These are precious and you really should open a shop on Etsy. They would fly off the shelves. Way too adorable! Love the beautiful, simplicity of the cards. Such a great gift! You are so darn talented, Wendy. Really, these are absolutely adorable cards. 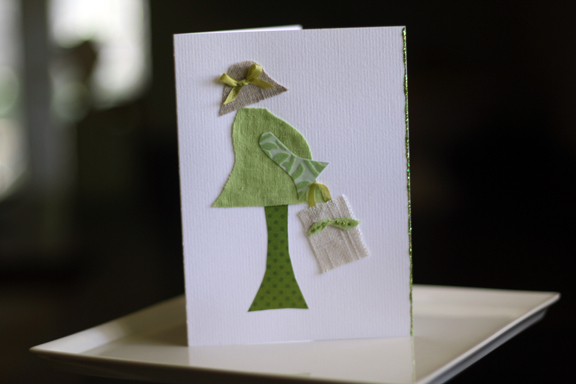 I think these are adorable and I believe that a hand-made card is especially loved and appreciated. You certainly have a beautiful talent. You have serious talent. I love these. LOVE. Any expectant mother would be thrilled to tears to get such a lovingly crafted gift. These cards are gorgeous! I love the idea of framing them for the nursery. What a cute little arrangement that would make! You make the most beautiful cards Wendy, every little details is perfect. My favorite is the little bib! So cute and delicate! These cards are so cute! Thanks for sharing the idea! I just LOVE today’s bebe shower posts! So, so great! XO. The cards are so adorably cute. I am seriously envious of your creative abilities! You just make the most beautiful cards. What a truly beautiful gift to receive. Oh, man, how did I miss getting over here on Wed? These are amazing, girl. You are so talented …. I just wish we could have all been together in real life for Josh and Maria. Such fun! Love you and happy weekend! I want your talent- these are the most adorable cards ever. Lucky Maria!! These cards are absolutely precious!! These are perfectly adorable; I bet Maria will be squealing with love and adoration when she gets these in the mail. Wendy, You just can’t throw your cards away. I know I have received some of your work and they are just to cherish forever. 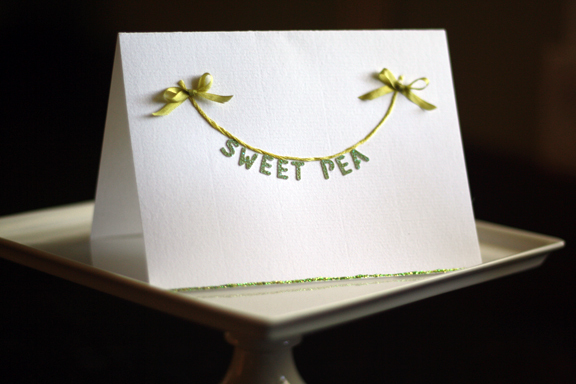 I made the card with the words Sweet Pea XXXXX, with the X being the childs last name. On the inside I wrote: To X and X and X as you wait for your Sweet Pea to grow. The card was delightful. Without you, I could not have created it.